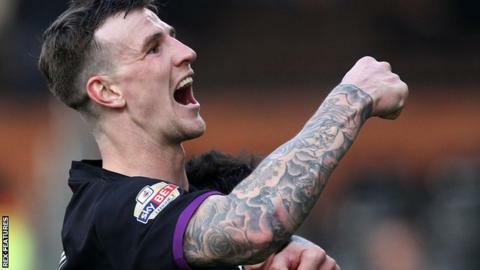 Bristol City defender Aden Flint is set to make his 100th consecutive start for the club when they host Championship relegation rivals Rotherham on Tuesday. The ex-Swindon Town centre-back, 26, has played the full 90 minutes in all of Bristol City's previous 99 games. Flint, who signed a new two-year deal in June, has helped City win the League One title and Football League Trophy since his ever-present run began. "I'd be delighted to make my 100th appearance, if selected," he said. "It's a good achievement. You don't really see outfield players making 100 consecutive games - it's normally a goalkeeper. It will be a good night - if we get the three points." Bristol City are currently six points clear of the relegation zone with seven matches remaining and lie one point above Tuesday's opponents Rotherham. "It's a massive game on Tuesday," Flint told BBC Radio Bristol. "Rotherham will not be a pushover. They have picked up some great results against good teams. "If we can get a win, we'll be on the way to being safe."